Two Brazilians have been found guilty of murdering a US-born Catholic nun and peasants' rights activist, and sentenced to long jail terms. Sister Dorothy Stang campaigned on behalf of poor farmers against ranchers and big logging companies. Rayfran das Neves Sales was found to have shot the 73-year-old nun six times on a muddy track in the rainforest. He was sentenced to 27 years and his accomplice, Clodoaldo Carlos Batista, to 17 years in prison. Prosecutors hope the convictions will open the way for three other men to be tried on charges of paying for and ordering the murder. They are in custody and awaiting trial next year, accused of offering more than $20,000 (£11,000) to the gunmen. The BBC's Tom Gibb in Sao Paulo says the case is being seen as a crucial test of Brazil's ability and willingness to clean up vigilante violence in the Amazon. Disputes between peasants on one hand, and ranchers and loggers on the other, are often settled with violence. More than 770 land activists have been killed in the last 30 years, but there have been fewer than 10 convictions in that time. Illegal land-clearing is threatening the future of the world's largest rainforest. Stang was killed on 12 February near the remote town of Anapu in Para state, notorious for corruption and land-related violence. 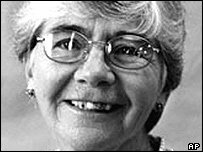 Some local landowners openly argued that Sister Dorothy's murder was in legitimate defence of property. The court heard a video confession Sales gave to police in which he described shooting her, execution style, as she knelt reading her bible. During the trial, he gave a different version, claiming the nun had reached into her bag and he shot her in self-defence, thinking she had a gun. Stang, born in Dayton, Ohio, had spent the last 30 years of her life living in the Amazon, helping poor settlers gain land and protect the environment. "This is justice for Dorothy and the poor of the Amazon," said her brother David Stang, who had flown in from the US. "We think it's just the beginning, but it's a great beginning," he said, referring to the trial still to come. "They're going to think twice about threats and assassinations from now on," said Jose Amaro, a Catholic priest and land activist who worked closely with Stang. A Senate commission concluded Stang's killing was part of a wider conspiracy, but critics say little has been done to pursue the others involved. However, Senator Ana Julia Carepa, who headed the commission, vowed after the verdict: "This is the start; now we're going to get the masterminds." Merry Christmas & the Very Best for 2006! Is it Goodbye, Red Cross?